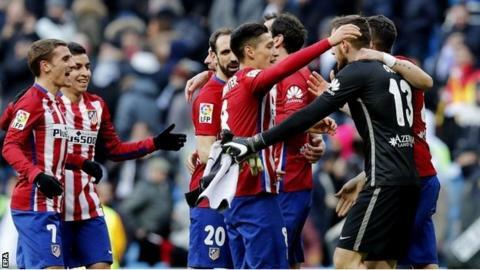 Atletico Madrid won a third consecutive La Liga Bernabeu derby to practically end Real Madrid's title hopes. Diego Simeone's visitors are now five points off leaders Barcelona, who have a game in hand, while Real are nine points below the champions. Antoine Griezmann scored the only goal, early in the second half, when he steered Filipe Luis' pass home. Real, who were two points off Barca when Zinedine Zidane took over, had not lost in his first eight games as boss. The result means Atletico are the first side in La Liga history to win three times in a row at the Bernabeu, as Real fans called for club president Florentino Perez to resign. Relive the action as it happened in our text commentary. Champions and leaders Barcelona, who are unbeaten in 33 games, host Sevilla - the last side to beat them - on Sunday (19:30 GMT). Match ends, Real Madrid 0, Atlético de Madrid 1. Second Half ends, Real Madrid 0, Atlético de Madrid 1. Ángel Correa (Atlético de Madrid) is shown the yellow card for a bad foul. Danilo (Real Madrid) wins a free kick on the left wing. Attempt missed. Danilo (Real Madrid) left footed shot from the left side of the box misses to the right. Assisted by Jesé following a fast break. Attempt missed. Antoine Griezmann (Atlético de Madrid) left footed shot from outside the box is just a bit too high. Attempt saved. Cristiano Ronaldo (Real Madrid) header from the centre of the box is saved in the centre of the goal. Attempt saved. Saúl Ñíguez (Atlético de Madrid) left footed shot from long range on the right is saved in the bottom left corner. Substitution, Atlético de Madrid. Ángel Correa replaces Fernando Torres. Substitution, Atlético de Madrid. Matías Kranevitter replaces Augusto Fernández because of an injury. Borja Mayoral (Real Madrid) wins a free kick in the defensive half. Attempt missed. Borja Mayoral (Real Madrid) left footed shot from the centre of the box is close, but misses to the right. Assisted by Jesé with a headed pass. Substitution, Real Madrid. Jesé replaces Isco. Attempt saved. Cristiano Ronaldo (Real Madrid) header from the centre of the box is saved in the centre of the goal. Assisted by Daniel Carvajal with a cross. Attempt missed. Borja Mayoral (Real Madrid) left footed shot from the left side of the box misses to the right. Assisted by Luka Modric. Attempt saved. Saúl Ñíguez (Atlético de Madrid) left footed shot from the right side of the box is saved in the centre of the goal. Assisted by Antoine Griezmann with a headed pass. Substitution, Real Madrid. Lucas Vázquez replaces James Rodríguez.